For other uses, see Suspended animation (disambiguation). As a theoretical concept, it has been included in a wide range of fiction books and films but has not been implemented as a medical procedure for either short or extended time. Suspended animation has been understood as the slowing or stopping of life processes by exogenous or endogenous means without terminating life itself. Breathing, heartbeat and other involuntary functions may still occur, but they can only be detected by artificial means. For this reason, this procedure has been associated with a lethargic state in nature when animals or plants appear, over a period, to be dead but then can wake up or prevail without suffering any harm. This has been termed in different contexts hibernation, dormancy or anabiosis (this last in some aquatic invertebrates and plants in scarcity conditions). This condition of apparent death or interruption of vital signs may be similar to a medical interpretation of suspended animation. It is only possible to recover signs of life if the brain and other vital organs suffer no cell deterioration, necrosis or molecular death principally caused by oxygen deprivation or excess temperature (especially high temperature). Some examples of people that have returned from this apparent interruption of life lasting over half an hour, two hours, eight hours or more while adhering to these specific conditions for oxygen and temperature have been reported and analysed in depth, but these cases are not considered scientifically valid. The brain begins to die after five minutes without oxygen; nervous tissues die intermediately when a "somatic death" occurs while muscles die over one to two hours following this last condition. It has been possible to obtain a successful resuscitation and recover life in some instances, including after anaesthesia, heat stroke, electrocution, narcotic poisoning, heart attack or cardiac arrest, shock, newborn infants, cerebral concussion, cholera, and voluntarily as in yogis. Supposedly, in suspended animation, a person technically would not die, as long as he or she were able to preserve the minimum conditions in an environment extremely close to death and return to a normal living state. An example of such a case is Anna Bågenholm, a Swedish radiologist who allegedly survived 40 minutes under ice in a frozen lake in a state of cardiac arrest and survived with no brain damage in 1999. Since the 1970s, induced hypothermia has been performed for some open-heart surgeries as an alternative to heart-lung machines. Hypothermia, however, provides only a limited amount of time in which to operate and there is a risk of tissue and brain damage for prolonged periods. The primary focus of research for human hibernation is to reach a state of torpor, defined as a gradual physiological inhibition to reduce oxygen demand and obtain energy conservation by hypometabolic behaviors altering biochemical processes. In previous studies, it was demonstrated that physiological and biochemical events could inhibit endogenous thermoregulation before the onset of hypothermia in a challenging process known as "estivation." This is indispensable to survive harsh environmental conditions, as seen in some amphibians and reptiles. Lowering the temperature of a substance reduces chemical activity by the Arrhenius equation. This includes life processes such as metabolism. In June 2005, scientists at the University of Pittsburgh's Safar Center for Resuscitation Research announced they had managed to place dogs in suspended animation and bring them back to life, most of them without brain damage, by draining the blood out of the dogs' bodies and injecting a low temperature solution into their circulatory systems, which in turn keeps the bodies alive in stasis. After three hours of being clinically dead, the dogs' blood was returned to their circulatory systems, and the animals were revived by delivering an electric shock to their hearts. The heart started pumping the blood around the body, and the dogs were brought back to life. On 20 January 2006, doctors from the Massachusetts General Hospital in Boston announced they had placed pigs in suspended animation with a similar technique. The pigs were anaesthetized and major blood loss was induced, along with simulated - via scalpel - severe injuries (e.g. a punctured aorta as might happen in a car accident or shooting). After the pigs lost about half their blood the remaining blood was replaced with a chilled saline solution. As the body temperature reached 10 °C (50 °F) the damaged blood vessels were repaired and the blood was returned. The method was tested 200 times with a 90% success rate. From May 2014, a team of surgeons from UPMC Presbyterian Hospital in Pittsburgh plan to try the above method in gunshot victims (or those suffering from similar traumatic injuries). The trials will be done on ten such severely wounded patients and compared with ten others in similar situation but who had no access to the above method. They currently refer to the procedure as Emergency Preservation and Resuscitation for Cardiac Arrest from trauma. This concept is speculative as well as frequently misunderstood. Human beings are unable to survive suspended animation at cryogenic (extremely cold) temperatures naturally. The limits of current technology are also insufficient to prevent loss of cellular viability. Cryonics operates under a fundamentally distinct paradigm from suspended animation in that it depends on future technology as part of its premise for working. It is not currently possible to preserve mental capacities and memories by this method and only cells and microorganisms are currently revivable. Suspended animation is distinct from cryonics because it does not require this "benefit of the doubt" concerning future technology. It is something that immediately and demonstrably works. The medical use of suspended animation will still require optimism that diseases can be cured. In order to achieve suspended animation, a reliable method to prevent damage to cells would be needed. Vitrification can achieve this in the laboratory only for small amounts of tissue due to cooling and other physical limits combined with cryoprotectant toxicity. There is also only limited evidence that it is possible in principle, because only very small organisms can be vitrified or frozen safely. Research on Caenorhabditis elegans has shown that memories can be recovered, and such organisms can survive vitrification with around 100% success rates. Some Research institutes like Roth Lab founded by Mark Roth have studied seriously the possibility of suspended animation, originally for chromosome isolation, and diagnosing several illnesses like cancer. An article in the 22 April 2005 issue of the scientific journal Science reports success towards inducing suspended animation-like hypothermia in mice. The findings are significant, as mice do not hibernate in nature. The laboratory of Mark B. Roth at the Fred Hutchinson Cancer Research Center in Seattle, Washington, placed the mice in a chamber containing 80 ppm hydrogen sulfide for a duration of 6 hours. The core body temperature of the mice dropped to 13 degrees Celsius and metabolism, as assayed by carbon dioxide production and oxygen use, decreased 10-fold. They also induced hypoxia on nematode embryos and zebrafish embryos, placing them in suspended animation for hours, and then re-animating them simply by returning the oxygen to the embryos. 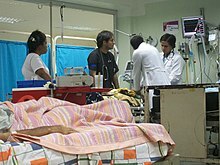 In trauma, the Roth laboratory and institutes such as Suspended Animation, Inc are trying to implement suspended animation as a medical procedure which involves the therapeutic induction to a complete and temporary systemic ischemia, directed to obtain a state of tolerance for the protection-preservation of the entire organism, this during a circulatory collapse "only by a limited period of one hour". The purpose to avoid a serious injury, risk of brain damage or death, until the patient reaches specialized attention. Massachusetts General Hospital in Boston announced they had been able to hibernate mice using the same method. Their heart rate was slowed down from 500 to 200 beats per minute, respiration fell from 120 to 25 breaths per minute and body temperature dropped to 30 °C (natural: 39 °C). After 2 hours of breathing air without hydrogen sulfide the mice returned to normal. Further studies are needed to see if the gas had damaging effects on the brain, considering the effect of hydrogen sulfide on the body is similar to hydrogen cyanide; it does not slow the metabolic rate but rather inhibits the transfer of energy within the cell via ATP. Experiments on sedated sheep and partially ventilated anesthetized pigs have been unsuccessful, suggesting that application to large mammals may not be feasible. In any case, long term suspended animation has not been attempted. Ongoing research is being conducted into Tardigrades to isolate the genes responsible for their metabolic transformation into a Glass like state thus fully preserving them for decades in Dry conditions. ^ Asfar, P; Calzia, E; Radermacher, P (2014). "Is pharmacological, H2S-induced 'suspended animation' feasible in the ICU?". Crit Care. 18 (2): 215. doi:10.1186/cc13782. PMC 4060059. PMID 25028804. ^ "FROZEN IN TIME Terminally ill Brit schoolgirl, 14, wins court battle to have her body cryogenically frozen for £37k after her death in case she can be resurrected in future". thesun.co.uk. 16 November 2016. Retrieved 4 June 2017. ^ Asfar, P. (2014). "Is pharmacological, H2S-induced 'suspended animation' feasible in the ICU?". Critical Care. 182 (2): 215. doi:10.1186/cc13782. PMC 4060059. PMID 25028804. ^ "How do frogs survive winter? Why don't they freeze to death?". Scientific American. 11 July 2014. Retrieved 3 June 2017. ^ ":Molecular death is". Forensic Medicine_gradestack.com. ^ "Definition of suspended animation is". Forensic Medicine_gradestack.com. ^ "'Miracle' student survived his body being frozen solid". independent.co.uk. 20 January 2016. Retrieved 5 June 2017. ^ Warick, Jason (23 February 2002). "'Miracle child' bears few scars one year after brush with death". Edmonton Journal. p. A3. ^ "Is Human Hibernation Possible?" (PDF). nature.berkeley.edu. ^ Mihm, Stephen (11 December 2005). "Zombie Dogs". The New York Times. ^ "Doctors claim suspended animation success". The Sydney Morning Herald. 20 January 2006. Retrieved 10 October 2006. ^ "Left between life and death: First 'suspended animation' trials set to begin in bid to buy time for stabbing and gunshot victims". ^ Fahy, Gregory M.; Wowk, Brian (2015). Principles of Cryopreservation by Vitrification. Methods in Molecular Biology. 1257. pp. 30–33. doi:10.1007/978-1-4939-2193-5_2. ISBN 978-1-4939-2192-8. PMID 25428002. ^ "Basic principles of cryopreservation" (PDF). fao.org. ^ "Cryogenic Storage of Human Hematopoietic Progenitor Cells" (PDF). bioprocessintl.com. ^ "Vitrification: Preservation of Cellular implants" (PDF). oulu.fi. ^ Blackstone, E.; Morrison, M.; Roth, M. (2005). "H2S induces a suspended animation-like state in mice". Science. 308 (5721): 518. CiteSeerX 10.1.1.626.8554. doi:10.1126/science.1108581. PMID 15845845. ^ "Oxygen deprivation causes suspended animation in the zebrafish embryo" (PDF). pnas.org. ^ Bellamy, R; Safar, P; Tisherman, S. A; Basford, R; Bruttig, S. P; Capone, A; Dubick, M. A; Ernster, L; Hattler Jr, B. G; Hochachka, P; Klain, M; Kochanek, P. M; Kofke, W. A; Lancaster, J. R; McGowan Jr, F. X; Oeltgen, P. R; Severinghaus, J. W; Taylor, M. J; Zar, H (1996). "Suspended animation for delayed resuscitation. Crit Care Med. 1996 Feb;24(2 Suppl):S24-47". Critical Care Medicine. 24 (2 Suppl): S24–47. doi:10.1097/00003246-199602000-00046. PMID 8608704. ^ "Gas induces 'suspended animation'". BBC News. 9 October 2006. Retrieved 10 October 2006. ^ Haouzi P; Notet V; Chenuel B; Chalon B; Sponne I; et al. (2008). "H2S induced hypometabolism in mice is missing in sedated sheep". Respiratory Physiology & Neurobiology. 160 (1): 109–115. doi:10.1016/j.resp.2007.09.001. PMID 17980679. Supendended Animation Labs: Research focuses, on methods to reduce ischemia and ischemic damage to the body tissues.